Pahang, the largest state in Peninsular Malaysia is a treasure chest full of natural, charming and priceless jewels. One of Pahang’s most valuable jewels is Taman Negara, which offers fabulous assets that are timeless and highly valued by Malaysians, tourists, environmentalists and nature lovers the world over. 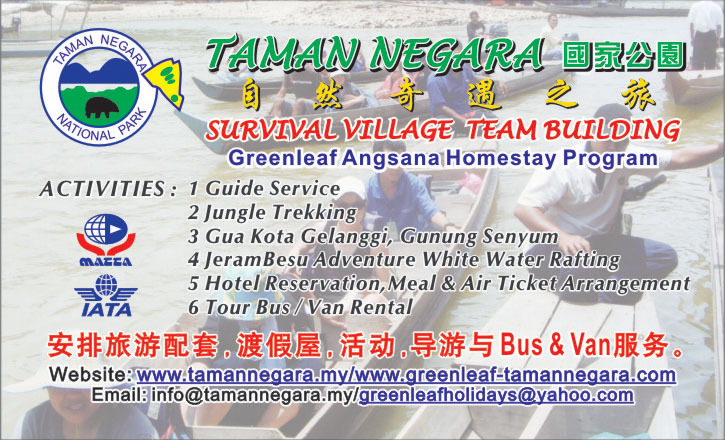 To experience the full glory of the tropical rainforest there is perhaps no better place on earth than Taman Negara. Legally declared an area for conservation in 1938, the 130 million-year-old Taman Negara is a heaven for the nation’s flora and fauna. Sprawled across 4,343 square kilometers of verdant tropical splendor, Taman Negara (formerly known as King George V National Park) beckons you to a mysterious world older than the Congo or the Amazon. Located at the very heart of Pahang’s tropical forest, Taman Negara has been undisturbed for millions of years. It maintains a natural habitat for a variety of flora and fauna, some of which are exclusive to this part of the world. Trees that are a hundred years old form a giant canopy above you as you enter into Taman Negara, which is accessible through Jerantut, the main entry point. 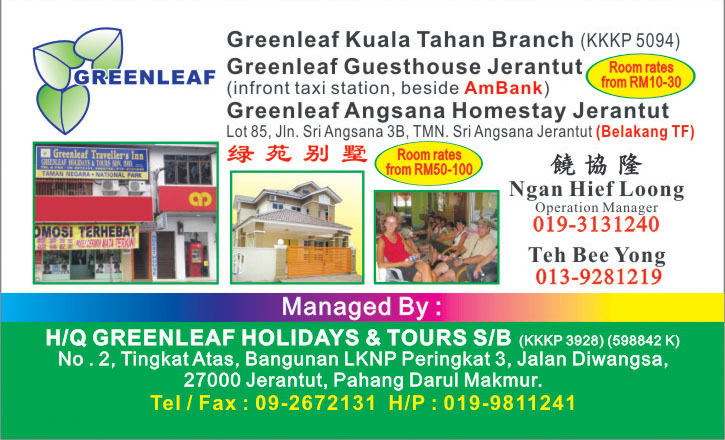 A visit to Taman Negara is a journey at one with nature. The sight of wild animals roaming, crystal clear streams flowing through the jungle, spectacular rock formations, lush vegetation and a variety of wild flowers will take your breath away. Jungle tracks, camp sites and resorts have been constructed to blend in with the natural surroundings. Many structures have been built strictly for the observation and appreciation of the towering forest and its inhabitants. Experience this 130 million-year-old adventure and you will come away with a deeper understanding and appreciation of the world. The myriad wildlife in Taman Negara can be seen and photographed from the many observation hides available here. One of the most popular hides, Tahan Hide, is just a five-minute walk from the Park’s headquarters. Other hides include the Tabing, Cegar Anjing, Belau, Yong and Kumbang Hides. You can take day or night time jungle walks or stays in a hide and maybe catch a glimpse of some of the 250 species of fauna that exists within the park boundaries. The most easily seen and heard are the hornbills. Fire back pheasants are often flushed out when you are walking the jungle trails. Fish eagles and kingfishers are commonly seen close to the river areas and Sungai Tahan is a favorite haunt of the Masked Fin foot. From the interior of Taman Negara, some of the larger animals which may be seen include seladang (wild ox), sambar, barking deer, wild boar and tapir. Observation points have been set up specifically overlooking salt licks and grassy clearings for you to observe wild, often shy animals. These hides allow the visitor to spend a night away from the resort to observe the nocturnal activities of the animals in the forest. Other animals which inhabit the Park are elephants, tigers, leopards, sunbeams and the extremely rare Sumatran rhinoceros. Long-tailed Macaques are often visible on the jungle trails by the river. Leaf Monkeys are often heard screening, while the White-handed Gibbons and the siamang, which usually roam in family groups, make exciting, if noisy morning chorus from high in the forest canopy.